I was 9 when I first heard of Dungeons And Dragons. I was 22 when I played my last role-playing game. When I think about or talk about being a teenager I tend to put the heaviest stress on music and how important it was to me. Then books and comics, and then maybe a nod to the angst and sexual frustration side of things. Dungeons And Dragons, and its warty kin, don’t get much of a mention. As I was saying in the pub the other day – it’s not that I’m ashamed of them exactly, but it’s not the kind of thing you talk about with people who didn’t, er, do it. I may not have had anyone to play the game with, but that was no barrier to the game eating up my time. A hobby whose basis is sitting around a table talking, role-playing nevertheless has a solitary, solipsistic side. There were rules to be swotted up, of course, but there were also characters to create, and the characters had to be written down on character sheets, which needed to be designed, and then of course you could start designing dungeons… the image of gamers as inadequate bedroom hermits was always a little unfair (RPGs are inherently social), but only a little. Three months or so after I was given the D&D Basic Set, I played my first game. My parents used to take me to a group for Gifted Children which took over a school once a month and ran (in theory) lots creative activities. I don’t remember ever having to prove I was ‘gifted’ in order to attend these things and my suspicion now is that they were opportunities for right-thinking Mums and Dads to tell each other how clever their kids were and eat a lot of cake. The activities were puny: one potters wheel which was always being used by someone else, and a lot of chess. But one weekend someone had been allowed to run a D&D game. How did I like it? I loved it. It was everything the rulebooks had promised – the secret of roleplaying is that if you’re an imaginative kid the referee hardly needs to do any work to ‘sell’ the story to you, you’re filling in the blanks all the time yourself. It was a simple adventure – two groups of monsters at war with each other, the players getting stuck into the feud, and I think that (yes!) a gelatinous cube was involved too, though I never encountered it. But it seemed incredibly rich and immersive – wounded and separated from the other players, I had to bargain for my life with a monster: I was the center of attention, the lead actor, except I had no idea what would happen next, and it was stupendously exciting. And – for a fairly shy boy – liberating. The entire of my roleplaying ‘career’ was a mostly unsuccessful attempt to capture that feeling again, or to spark it in other people. Because by the time I got home I knew that I didn’t just want to play D&D, I wanted to be the person creating the magic that I’d just felt. I had to run games, and I had to do it soon. My 1973 birthdate put me right on the frontline of the most revolutionary development in kids’ leisure time since TV had been invented. Arcade games started appearing in the UK in 1978, and two or three years later home computer games machines showed up. A little before I got my first D&D set I went to a friend’s house and played my first computer game on a Texas Instruments computer – “Wumpus”, a “you are in a cave” monster hunt, primitive but totally gripping. Nobody my age had any idea of whether a game was sophisticated, or complex or even predictable: our minds and aesthetics were wide open for videogames. That same computer also dialled up to a network, Prestel I think, and you could play adventure games via that too: we were only allowed to play for a handful of minutes because of the phone bill, but it was enough. The graphics were so alive, so colourful, and the sense of possibility so vast: I can still half-remember a vivid green and yellow screen with a series of numbered choices, each one a door which I was never allowed to open. “Dad, can we-?” I asked when I got home. “No” – my friend’s father worked in telecoms, he got deals on the equipment, for anyone else it was a prohibitive luxury. Videogames absorbed and killed tabletop gaming in the end, as soon as their processors could simulate an RPG ruleset: the tradeoff between social interaction and cool graphics was no tradeoff at all. In return the structure, worldview and concepts of RPGs have thoroughly infected videogaming. The infection began early: the original text Adventure game is steeped in the same trad-fantasy trappings (thieves, dungeons, ogres) as D&D. In 1982, home videogames were one of two developments that turned my desire to get my friends roleplaying from weird to acceptable. The other was Fighting Fantasy, the series of interactive gamebooks (starting with The Warlock Of Firetop Mountain) that became a major craze at school. 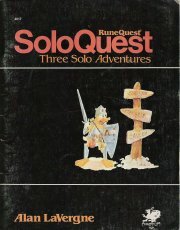 The gamebooks were a hugely successful try at translating D&D’s attractions (heroic ‘lets pretend’ adventures governed by a fair ruleset) into a solo format: they also provided the descriptive and plot depth that early computer games promised but couldn’t deliver. I loved them, and I loved that my friends loved them, because it made D&D into an easy sell-through: a few gamebooks and they knew all about goblins and spells and dragons. So Fighting Fantasy sparked the interest and videogaming provided the motive. Parents were suspicious of computer games – they had no redeeming value and would send us all blind. But six of us getting together on a Saturday afternoon to play other games – even if they were strange ones that no Mother understood – was surely better. Of course within an hour of sitting down to play D&D somebody would have plugged the ZX Spectrum in and it would be Atic Atac all the way. Everyone apart from me approved of this: I would have liked more roleplaying. But some was better than none. Dungeons and Dragons’ sell was simple and appealing. You were the hero in a fantastic world – you could star in an epic saga of your very own. Set against this was the fact that Dungeons and Dragons was a game, and moreover had been put together by hardened wargamers. This meant rules, and lots of them. What’s striking to me now is how TSR (the publishers) hit quite by accident on marketing gold – an endless series of rulebooks and expansions, each minutely detailing a different area of gameplay. I don’t remotely think this is because Gary Gygax planned a gotta-catch-em-all strategy; I think it is because he kept thinking of new rules and wanted somewhere to put them. Adding to the lunacy was the game’s split into D&D and Advanced Dungeons And Dragons. The former was hardly simple – the latter yet more complicated, and apallingly structured. Even so by the standards of the emerging RPG genre AD&D was only averagely hard to grasp – some games carried more fearsome reputations. The character generation process in Chivalry And Sorcery, a medeival stickler, was reputed to take six or more hours. Players of D&D split into two groups – those who cared about the rules, and those who didn’t. A referee from the former camp mixing with players from the latter was a recipe for a short, and possibly tearful game. But even a referee who believed in the ‘spirit, not the letter’ – like me, for instance – would find themselves in difficulty when a player turned out to be a ‘rules lawyer’. It’s hard to keep a game flowing when every decision requires endless cross-referencing and justification. To make matters worse, Gary Gygax himself had a firm and oft-stated position on the use of rules: they mattered. All of them. ALL. OF. THEM. If you were ignoring – or worse, modifying – a rule, what you were playing was not D&D. The result of this forest of rules was that the AD&D gameworld evolved a logic of its own which took it well away from any book or saga any of its players might have encountered. Heroic fantasy rests on its sense of mystery, magic, the inexplicable. Wargaming rests on its internal consistency and statistical simulation of likely events. The two don’t naturally mix. As we’ll see in the next post, D&D’s attempts to quantify the fantastic resulted in a game of often bizarre implications. Alignment: AD&D employed a notorious form of psychometric profiling, the Alignment System, whereby every living thing’s personality could be summarised by a phrase like “Lawful Neutral” or “Chaotic Good”. The two axes of alignment dealt with reaction to authority and moral outlook: these were Gary Gygax’s only concession to the idea that characters should have a personality. Absurdly, each of the nine alignments had its own language which only similar people could understand – various glosses tried to explain this idea, settling on the notion that “alignment language” was sort of like body language. Bad people, in other words, smile less. Economics: The unit of currency in AD&D was the gold piece. There were also silver pieces, worth 1/10 of a gold; copper pieces worth 1/10 of a silver, and platinum pieces. Worth 10 times a gold piece, you’d think? No. Five times. And then there was the electrum piece, worth half a gold piece. All these different coins were accepted without question anywhere in an AD&D world – who minted the coins, and how this oddly complex five-tiered system had evolved, and why the electrum piece even existed other than to show that Gary Gygax knew the word “electrum”… these questions were left to the individual referee’s discretion. Greed Is Good: You could get experience points in two ways in AD&D. If you killed a monster, you got some XP. And you got 1 XP for every gold piece you found. I am pretty sure you had to find them – you couldn’t just bank them and grow powerful from the interest. But on the other hand it was also implied you had to actually get the things home, just seeing and planting a metaphorical flag on the treasure wasn’t enough. Why did having gold improve your fighting or magic skills? Don’t ask that. The general thinking was that the experience-for-gold trade-off represented a boost from completing a particular mission, and most adventures were designed to follow this logic, with the big pay-off at the end. The obvious solution – of just giving XP based on how well an adventure went – was forbidden by Gygax, though nearly every ref just ignored him. Encumbrance: The gold-as-XP logic of the AD&D gameworld meant that characters would routinely be faced with the problem of getting several tons of cash from place to place. The rulebooks were quiet on the logistics of this, but did include an extensive ‘encumbrance system’ to simulate the effects of excess weight on movement and combat. Of all tables in the AD&D rules the Encumbrance Tables were the most widely ignored* – referees quickly worked out that even trying to take them seriously would render characters completely immobile. *actually, no, the Armor Class Modifier Tables were the most ignored, but of them we need not speak. Enough of the rules. How did a typical D&D game actually unfold? The truth about role-playing is this: the conflicts between the heroes and their monstrous foes are feeble compared to the ongoing struggle between the referee and the players. Every session would see a titanic battle of wills as the referee attempted to get the players to do something that would move the plot along and the players happily did anything but. It didn’t help that published adventures were written by inhabitants of a utopia where player characters did outrageously unlikely things at the slightest hint. As a referee you would learn to fear blithe phrases such as “when the players figure out the puzzle” or a laughably optimistic instruction to “stress the might of the opposition – players will soon realise that combat would be hopeless”. Eventually things would settle down and the players could get on with talking to the rich merchant who was looking for adventurers to rescue his daughter from the goblins. Or to the shadowy hooded figure in the corner – Tolkein unwittingly to blame for the whole tavern trope, as with so much else. “Will you help my child? he pleads piteously” “I backstab him.” And so on until the dungeon was reached. It’s surely an indictment of something that the two pop-culture events I’ve been most excited about this year have been a comics series and Doctor Who. Certainly I’ve been spending more time than is perhaps healthy exploring my childhood passions: just after Christmas I impulse bought a copy of The Warlock Of Firetop Mountain in a service station, expecting – and getting – memory-rushes from the artwork. So what’s going on? It’s one or all of three things. i) the degeneracy of my cultural receptors into soft-option mulch; ii) a period of self-reconciliation before I move on a happier and less guilty man; iii) a tour of childhood things before I become a father myself. Not that fatherhood is impending, hold the congratulations, but that is the plan. The big question then is – would I actually role-play again? There was a flurry of discussion around this a couple of years ago, which never quite got serious. The idea of various Freaky Trigger writers getting together for a final game of D&D is not a great one: for one thing, we’d just end up getting drunk. (OK, maybe it is a good idea). If I was serious about wanting to play RPGs, I wouldn’t ask my friends; I would look in the Internet for a local group and go along. But I’m not serious about it. Am I? …No. It’s too much of a commitment, it would hardly be the same and by the time I stopped playing I had major reservations with the genre-bound attitude of most RPGs anyway. So what was I doing last Tuesday downloading scanned-in versions of old AD&D modules? I3-I5, to be specific, the Desert Of Desolation series that touched every Arabian Nights and Egyptology button and provided me with (probably) my peak AD&D gaming experiences. I thought I was doing it to get those memory-bursts I talked about but only the maps and cover art were fully scanned, the rest was typed in (!) by some too-dedicated archivist. And to be honest I couldn’t even remember the covers that well. I vaguely scanned through I4 and felt a bit stupid: if I ever knew anything about module design I’d surely forgotten it. Really I downloaded the modules because they were there. I was so shocked to find them, and bandwidth is so cheap, that I clicked on them without thinking: a snapshot of consumption in a file-sharing age. Of course what I remembered wasn’t the rote descriptions and bits of cardboard, it was what my friends and I did with them. Or it was just my friends. A tiny piece of gaming history made itself available to me yesterday – this PDF of White Dwarf #1. I’d never seen a copy before but its instantly evocative. Of what? Not my gaming past exactly – WD had brightened up its act by the time I got on board – but of the lost ferment of 70s nerd culture: letraset printed fanzines, heavily inked Conan-ripoff art, a thriving topsoil of micro-entrepreneurs. “Thane Tostig – a new fantasy game, 70p inc P&P”, “Godsfire – a three-dimensional war game”, “Includes 242 perforated counters”. You can see very similar adverts – and exactly the same art styles – in reprints of Cerebus #1, published in 1977, the same year as the first White Dwarf. In early computer fanzines you won’t see quite as many barbarians or spaceships but you will see the same single-minded, lawyerish dedication, and you might see the lame student humour (“New character class: The Pervert”). From a gaming perspective White Dwarf#1 is illuminating – it’s a mini-culture desperate to organise itself (some level of organisation being the basic requirement for gaming to even exist) and trying to work out how to do it. It’s also emphatically not a role-playing culture, in the way it became in the 80s: there’s little of the “YOU are the hero”, self-actualising rhetoric that gave RPGs and gamebooks their brief burst of mass popularity. These things are boardless wargames, and the content reflects this. The announcement of the D&D Society’s formation sets the tone, laying out the society’s aims: “(i) bring players in contact with one another (ii) clarify basic D&D rulebook problem areas“. The impression given throughout the magazine is of wargamers struggling to reconcile their need for unambiguous rules with the freeform play implicit in the very idea of RPGs: nobody involved seems to realise what they’ve got into. The longest article is the staggeringly complicated and boring “Monstermark” system, a way of grading monsters which the magazine doggedly stuck to for most of its early life. The second longest is Lewis Pulsipher’s more intriguing look at the “philosophy” of D&D – he sees no middle ground between strategic rules-based play and “silliness”, and comes down very hard on the latter. During my gaming days these were the roots of fearful schisms in the community, schisms which I took, from a distance, passionate stands on. Back then I would have read White Dwarf #1 in disgust, embarassed at its limited, pedantic worldview. Now the magazine fills me with a painful fondness for a petty, enthusiastic, lost world. At first glance the I Was A Goblin series seems out of place on TMFD. Certainly when I was small, and played D&D, not many of my fellow enthusiasts were what you might call sportsmen. The gangly types were occasionally required to make ungainly stumbles round the track on sports day, and there was never the kind of institutionalised jocks/nerds hostility you seem to get in American high school, but these were still two cultures. I don’t even think any of the people I gamed with were fans of sport, or not with any passion. Play in “Football” (Box Set available from TSR) is based around groups of people who have to work as a team to achieve their objectives. These groups are a balance of four basic classes of player, though some players can ‘multi-class’ effectively and variant classes abound. On their adventures the team, or ‘party’ has a set ‘marching order’ designed for the greatest tactical effectiveness. Roles within the party vary: saving the party from damage, sneaking around to try and ambush the opposition, and so on. Some players employ a repertoire of magical effects and tricks, which can be very effective, though often leave them physically more vulnerable. The adventures themselves consist of a series of brutal – and oddly repetitive – conflicts, often set in ancient locations which require lengthy travel to reach. Some of these encounters are randomly generated, and contentious outcomes are decided by the intervention of a referee. – quests for specific and valuable artefacts, which usually require a lengthy campaign to acquire. – searches for ludicrous amounts of cash well beyond any player’s ability to spend. – improvement in player abilities. If a player improves enough they may move ‘up a level’. A particularly successful campaign can result in an entire party moving up a level at the same time! In between campaigns players tend to visit taverns and generally debauch themselves, though higher level ones often prefer to spend time in their castles. This all maybe explains why I found it easier than I thought to start liking football. It almost certainly explains why I’ve translated this vague liking of football more into an appreciation of the Football Manager series of games than into actually getting out and watching any. Dungeons and Dragons is the game most identified with roleplaying, but it certainly wasn’t the only option. In fact, once you’d got into the hobby you quickly realised that most vocal gamers had a certain disdain for D&D, seeing it in very much the same ways Mac owners or Linux users see Windows: a horribly flawed system plagued by rotten design choices, inconsistencies and glaring holes – but one which dominated the market nonetheless. So what was the Mac in this analogy? The RPG scene teemed with games, but when I started playing probably the biggest alternative was RuneQuest, a fantasy game like D&D but with several core differences. I happened to come into possession of a .pdf of the RuneQuest core rulebook the other evening and skimming through it was reminded of what an elegant game it could be. RuneQuest and D&D differed starkly in ethos and approach. In D&D a character was little more than a point-scoring machine – his background and personality practically irrelevant to gameplay. RuneQuest offered players a proprietary setting, the bronze age fantasy world of Glorantha, and stressed a character’s role within its (relatively) complex society. The fantastic elements were tied into the world, all deriving from its various religions (“cults”), which were in turn based around a series of runes, each cult drawing its power from some runic combination. The backdrop of RuneQuest was a series of wars between a Romanesque empire and the barbarian kingdoms it was seeking to conquer. Characters would generally be mercenaries on one or other side – the game was progressive (in fantasy terms) in that it didn’t present either Empire or barbarians as ‘good guys’. Fans of RuneQuest became passionately involved in the Gloranthan setting and when the game was eventually redesigned and it was ditched the core following swiftly dissipated. But for entry-level gamers the Gloranthan elements could be limiting, and the game’s key flaw was that it was rubbish at explaining exactly how the runic system worked. To become a Rune Lord, you were told, a player would have to go on a Rune Quest – and that was it, no more detail given on a presumably pretty important element of the game. What this meant in practise was an emphasis on less powerful characters: every RuneQuest game I ever took part in, Gloranthan or not, involved weak characters grubbing out an adventurous living. Since RuneQuest rules meant that combat was dangerous and often fatal, encounters that would have been bread-and-butter stuff in D&D took on huge significance, and talking your way our of a fight was often as important as winning one. This was RuneQuest’s great problem – it made for hugely immersive games almost entirely lacking in instant thrills. Aged 10 I admired the rules and the fleshy warrior lady on the front cover, and never played it – when I did actually run a game, in my mid teens, it was a massively satisfying experience because of the subtle ways the rules encouraged character play, teamwork and so on. In the next I Was A Goblin I’ll talk about the different rules approaches and explain exactly why D&D was such a massive success and so influential.